In addition to regularly fundraising for the Farley Foundation and donating to OVC Pet Trust , we are the first and currently only veterinary collection site for Pets of the Homeless in the GTA. 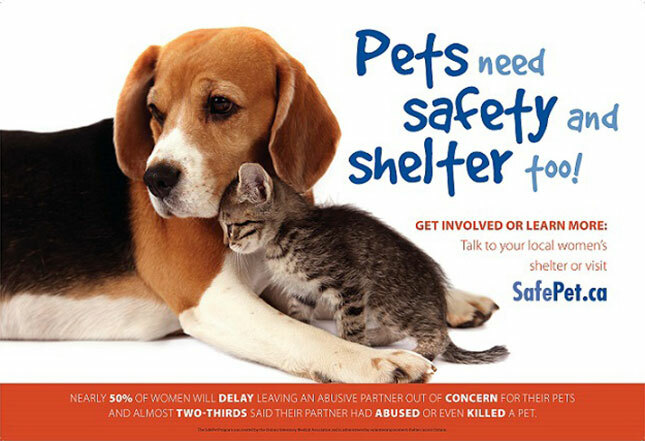 We also support the OVMA's SafePet Program which assists women leaving abusive partners by providing care for their pets. Please contact us if you would like more information on any of these worthwhile causes. Helping low-income pet owners with life-saving veterinary care. Researching to find cures for common pet ailments. We accept and deliver donations for homeless people and their pets year-round through the Fred Victor Bethlehem United Shelter, the only shelter in Toronto that allows pets to accompany their owners. Food, treats, beds, toys, collars, leashes, bowls, clothing, litter boxes, cat litter are all welcome. Slightly expired is fine, as is part-bags. Other desired items for the people include hats, mittens, scarves, socks, jackets, comforters, blankets and tampons. by providing temporary care for their pets. A charity specifically for cancer, especially for Golden Retrievers. Providing dog guides for Canadians with disabilities. Providing veterinary care where none exists. Grey Bruce Aboriginal Qimmiq Team: An volunteer driven charity that partners with First Nation communities in Northern Ontario to improve community and animal welfare by assisting with sustainable humane dog population control. Spay and neuter services as well as vaccination against communicable diseases, parasite control and animal identification is provided to the dogs in these communities. Dr Fenger will be joining them up on a trip this September. August 2018: We recently had a very generous personal donation from one of our clients. The money is in an account to be used for pets who would otherwise not be able to receive needed treatment. If you feel that your pet is suffering but are hesitating to bring your pet in due to cost concerns, then please mention that you saw this note and we will do our best to help you.